Australian Survivor fans will be elated to learn that TEN has confirmed a second season -and auditions are opening for 2017. It follows glowing fan support for the debut TEN season, despite an expanded cast and episodes in Samoa. TEN Chief Content Officer, Beverley McGarvey, said: “We are pleased that audiences have embraced Australian Survivor and that the local format has impressed new viewers as well as winning over critics and super fans. Our contestants played the game with a genuinely Aussie twist and Jonathan LaPaglia has been a wonderful host and really made his mark navigating the intense Tribal Councils. Endemol Shine Australia’s Managing Director – Unscripted Content, Peter Newman said: “We are immensely proud of the first season of Australian Survivor. It is a genuine joy to produce this phenomenal format and we look forward to working with our partners at TEN in creating a thrilling second season”. “We were blown away by the capabilities of our first cast, and now that everyone has seen Australians play this incredible game we can’t wait to see who wants to put their hand up to take part in season two”. 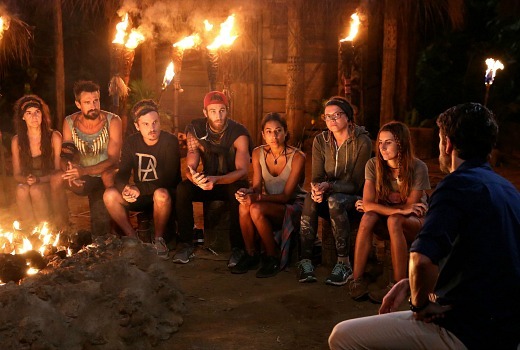 TEN has just three episodes remaining before one castaway will win the $500,000 prize and title of Australian Survivor and is promising plenty of fireworks. The tension explodes on Monday night as friend turns against friend in a battle to make it through to the Grand Finale. Happy Dance! It can only get better and I think it has been a brilliant series. Aussie’s are too honest for their own good – have to go running back to their alliance and tell them who is about to make a move, have to confess to their best friends that they’re going to write their name down but I still love you etc etc. I don’t think there were too many contestants or that the series has been too long. Have enjoyed the fiery Tribals complete with departing bombshells (which usually still get ignored). The challenges has been great for the most part too. The current U.S. series episodes seem very short by comparison and they don’t seem to show anywhere near as much of the “private” conversations trying to firm up gameplay. They need to air it head on with other prime times shows. No point starting at 7.30pm. Tackle the likes of The Block and XFactor head on. Allow them a jump start is fraught with danger. Bed it in with good rating show prior to the launch like NICS or after Bathurst races as an example. Great news.. this has been a standout series..
Is this still on air? Haven’t heard any mention of it anywhere for ages. LOL – you obviously don’t watch any of Ten, ONE or ELEVEN then! Fantastic! So happy it will be back in 2017 ? Terrible editing on tonight’s episode with absolutely NO footage of talking about Matt going. I think they were trying to go the ‘blindside’ route with the editing. I agree it was a bit underwhelming though with all the hype about press releases about a must see moment and blindside, it was kinda the most logical choice for the elimination. Yeah by “blistering blindside” they can surely only be talking about the viewers – seriously why insult our intelligence? In what way is someone who knows they’re a 50/50 shot of going “shocked” to actually get voted out? Btw, speaking of editing there is online scuttlebutt that the producers somehow managed not to notice that they included a very brief glimpse of Matt in Sam’s Jury Villa webisode (evidently they don’t film and wrap it between boots like the US) – it has since been edited out but apparently he was seen floating in the pool behind JL whilst Sam was talking to Nick. Totally agree. ‘Lets vote out Flick, we do not trust her anymore’ ‘We need to break up the power couple, lets vote out El’. So they all decided to blindside their loyal viewers instead? Sorry producers/editors – that’s not how it is done. Very happy with this Australian Survivor up to last night. It dragged on Faaarrr toooo loooong. Less contestants please! Someone brought out an immunity idol for the show! Brilliant news. I reckon Ten / Endemol will take on board feedback from season one and make the second an absolute belter! I’m hoping they look at all the things that haven’t worked this season and pare down on it. Too many contestants at the start, players who have never watched the international series (so don’t have any idea about the game) and perhaps unintentionally strengthening one team far beyond the others. But good news all in all. Wouldn’t expect a pare down, stips say to be available for 10 weeks same as this season, so I would expect the same level of contestants/days. We’ve got to remember that they evidently need more eps to make it viable, so they may not have much leeway to trim days/eps. If I was coming on board I’d just structure the twists/production interference better, limit the twists that exist solely for the twitter reaction and I’d also have at least 2 tribe swaps to mix things up. Getting a better balance of non-fans who need to be taught what to do vs. fans and a more diverse cast, would assist things as well. I’d consider putting idols back into the game (unclear whether they re-hid them this season), but if you are more proactive with switching the tribes up, it may not be needed, as you’ll get more people willing to play as their situation is more fluid. I am assuming they haven’t told you yet David but where is it going to be shot at. You must be available for a period of 10 weeks for the shoot. Dates TBC. Are they supersizing it again? In my opinion, I would love that but some people would hate it if they are going for 70 days. They said 10 weeks last time around. I expect 8 weeks of game (like this year’s show) with the players being on the island a week prior for prep (interviews for the website, promo shots where everyone dramticily stands on cliffstops, briefings reguarding health & safety on the island) and upto 3 days each way to account for travel between Australia and the location. If one of my colleagues is to be believed at work, it’s going to be Fiji as that’s where she wanted to get married next year, but it had been booked by Survivor. As both the US seasons have already filmed there, and she said it was the Australian version who had booked it, we can assume it’s there. That being said, these things change all the time, so I wouldn’t read too much into it at the moment. So…Fiji is a high chance. Though I kind of want to see Survivor: Arctic Circle. Brilliant news! It has been a wonderful series to watch – everyone involved in its making should congratulate themselves. Such a beautiful and engaging series. Well done all. Agreed. The Jury Villa is a bit too lovey duvy. I was expecting to see a bit more fire amongst the jury members. The “all is forgiven” mantra is a bit boring and unbelievable. I would be far less forgiving and nice to someone who orchestrated my elimination.